Three weeks ago I had a cheilectomy for hallux limitus with sesamoid involvement--and arthritis. Last Thursday, I had the stitches removed and was told to leave the BOOT off and to start working the great toe (left foot) to increase flexibility. Pain was pretty much gone, and I could move the big toe upward about an inch and down MUCH LESS--but I was doing it and going to PT. I was also told to get sneakers or soft shoes. I HATE THEM. I always wore high heel, which I know caused or certainly exacerbated my problem. But the real problem is that I am out of balance in flat shoes--and just tonight misjudged the top step and fell down the stairs halfway and injured my LEFT FOOT. I started shrieking and crying because I was so afraid that I blew my surgery. My husband helped me upstairs and back into my recliner to elevate the foot and ice it. Strangely, the great toe seems fine but the four lesser toes are NOT fine. It hurts to move them up or down and walking with weight bearing is painful. NOT EXCRUCIATING but painful. My foot surgeon is an hour away and it is now midnight in New York so I would NOT BOTHER him this late. toe if I have to immobilize the lesser toes? One last question----and thank you for this question area, profoundly---is it possible I just sprained my toes? And they need rest? Should I wear my boot again until I can see the doctor? If the pain goes away overnight, do I even need to bother the doctor? But I am so upset, I cannot tell you. I was healing so well and have so many official conferences and functions I must attend starting April 1st--and wanted so to be HEALED and HEELED! Regardless of how your foot feels this morning I would at the very least place a call to your surgeon and make him aware of what happened. Based on how the foot feels today will determine if any treatment is necessary. You certainly could go to a local doctor or emergency room and have an x-ray; there is no need to drive an hour for that. The purpose of an x-ray of course would be to see if you broke a bone somewhere in your forefoot or if you did some damage to the surgical area. Chances are if the surgical area is pain-free then one could assume there is no problem there. So, if you did not break any bones and the smaller toes are still painful, you probably either just bruised the toes or did some ligament damage which could be a condition like capsulitis which is turf-toe of the lesser toes. I understand your anxious to get well as quickly as possible. 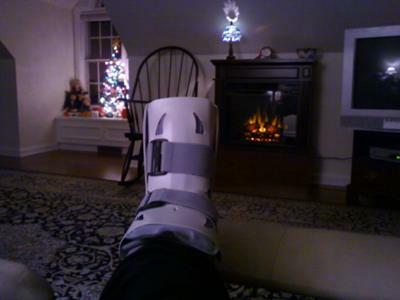 To that end, have your foot checked out and continue with physical therapy as that will expedite the healing process. I just wanted to thank you again and tell you that you were totally correct: my secondary pain was either capsulitis or metatarsalgia in my other toes after the topple down the stairs following my cheilectomy in the 1st MPJ. I carefully avoided moving the four lesser toes, always stayed in a stiff soled but padded shoe, and tried to work my big toe without disturbing the others, so they could heal. The result: at six weeks my X-rays were perfect and the pain in the lesser toes had diminished until almost gone. Now at ten weeks, I just returned from a huge conference in the enormous GAYLORD Opryland in Nashville, and I walked everywhere, albeit carefully in 4-inch heels--soft soled--with a 2-inch platform. These shoes feel like flats to ME (former and never again STILETTO wearer), and I am extremely thankful for this second chance and will protect my feet from now on. I wear two inch heels in the house and vary the elevation. I am so grateful, as I know many who have this surgery for Hallux rigidus or limitus are not so fortunate. And I credit you for the help that made the difference, Doctor. Thanks again and good luck to the rest of you foot sufferers! I had NO IDEA how horrid a bad foot could be---but once I did I will never take my feet for granted again! You are something else, Doctor. Thank you. Your response really did help me. I will continue the toe range of motion exercises and not be so fearful of injury. It's really more vanity than fear: I want my high heels back...just not stilettos EVER AGAIN--and after I fell I thought those days were over. I have faith again now--and even bought the INSOLIS set today. I am going to buy your orthotic right now, as well--with the metatarsal pad or bar, I believe you called it. I don't mind the movement exercises as much as I fear taking a big step with too much pressure on the toes, which I have done too frequently to searing pain. I believe a supportive orthotic will help with both range of motion and the increased confidence to walk more often. My goodness, if more foot and ankle specialists were like you, I doubt there would be so many multiple surgeries and re-injuries. Thanks for the kind words; just doing my job. Make sure you keep your surgeon in the loop as far as what you are doing and how you are progressing. Good luck. Thank you again, Doctor, for this fabulous website. It has been two weeks since I fell and a full month since my cheilectomy for hallux limitus. My foot still hurts, basically in the great toe area where the surgery was performed, especially when I push off too much on the toe, accidentally (for sure)--or during and after the toe exercises. But everything I've read says to force the toe up and down to the point of real pain--and then do it ten times more. My question is this: if I had arthritis in the 1st MPJ (which I did), won't forcing the toe to move cause more irritation and encourage more arthritic tissue in the joint? I'm not afraid of pain; I am afraid of re-injuring my poor toe. Perhaps the fall has made me skittish, but even my PT man tells me to let the foot rest, recommending distraction more than forced movement. After hearing your excellent commentary on sprained ankles and time required for healing, I find this FORCEFUL toe calisthenics antithetical to a successful recovery. On the other hand, I do understand that I must move the toe to avoid FROZEN TOE syndrome. Some people are running at a month and standing on tip toes after cheilectomy. HOW? I know everyone is different, but I would certainly love to hear your feelings on what you consider the proper balance between encouraging range of motion and outright TOE ABUSE! To put things in perspective, I have my patients exercising their big toe joint three days after surgery, not necessarily with physical therapy, but rather walking around the house without the surgical shoe. I want to get the toe to start bending as soon as possible. I am more worried about the toe joint freezing than I am about anything else. Osteoarthritis is a strange phenomenon in the sense that it can be argued that too much motion in a joint over the years, will cause the joint to wear down and become arthritic, however, after surgery excessive motion is necessary to keep the joint from becoming stiff and thus painful once again. Since I am not treating you, I would suggest you go by the recommendation of your surgeon as he or she is the one ultimately responsible for your well being. I really appreciate your comments. I did go to a local doctor, and as there was no pain three days later he felt I didn't need the XRAY. I actually got into bed after I posted and slept for 37 hours straight. Talk about a healing response. When I awoke, the pain was gone and I could walk normally--well, as normally as before I fell. I was hesitant to resume physical therapy in case I did have capsulitis but will see my surgeon on Monday and CONFESS and then resume therapy on Tuesday. Thank you again. And I LOVE SUMMIT, NJ--lovely little town.